Do you know this kind of recipe that you make for the first time and immediately know that this will be added to your recipe short list and and from now on will be made over and over? There aren’t that many dishes on my (all season) shortlist of baking and cooking. 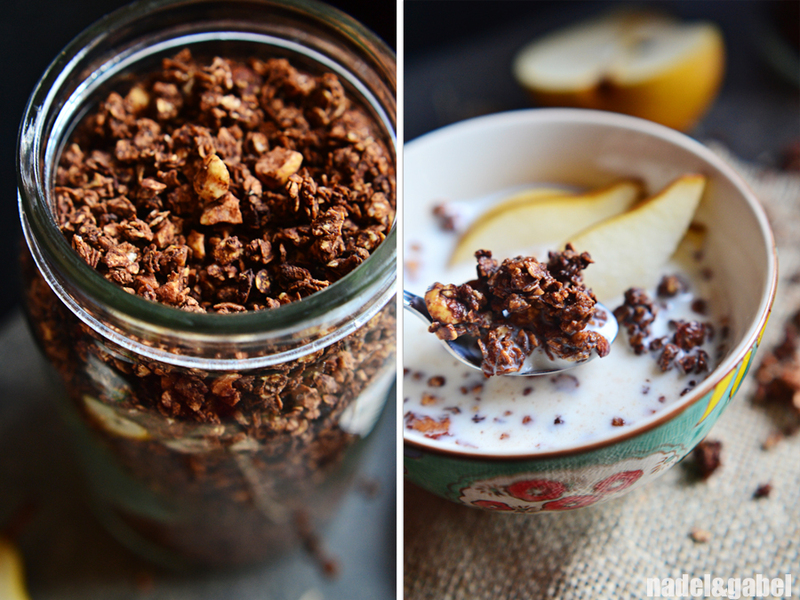 But this chocolate hazelnut granola already has made it on it. In fact, I don’t want to imagine the moment when I realize that I have nothing of it left in the pantry! 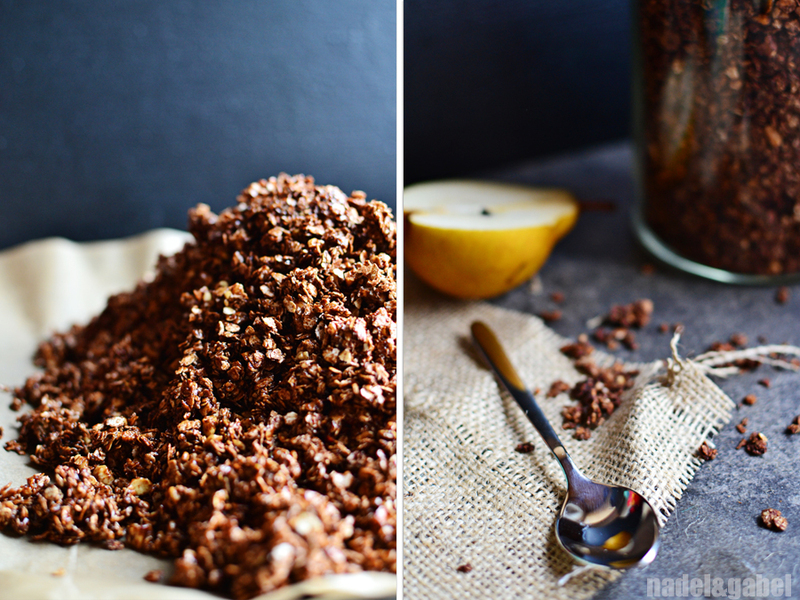 I have given quite some granola recipes a try. And it’s not that I didn’t like them. But then, they didn’t convince me that much that I started to make them on a regular basis. 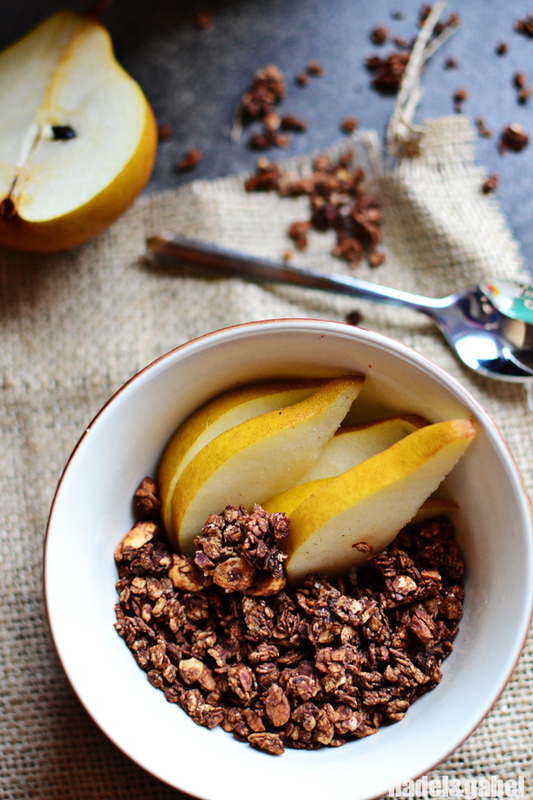 When I read Nicoles chocolate crunch granola recipe I knew that this could be my granola: It promised clusters and high danger of addiction even for convinced non-breakfasters – and it has chocolate in it. 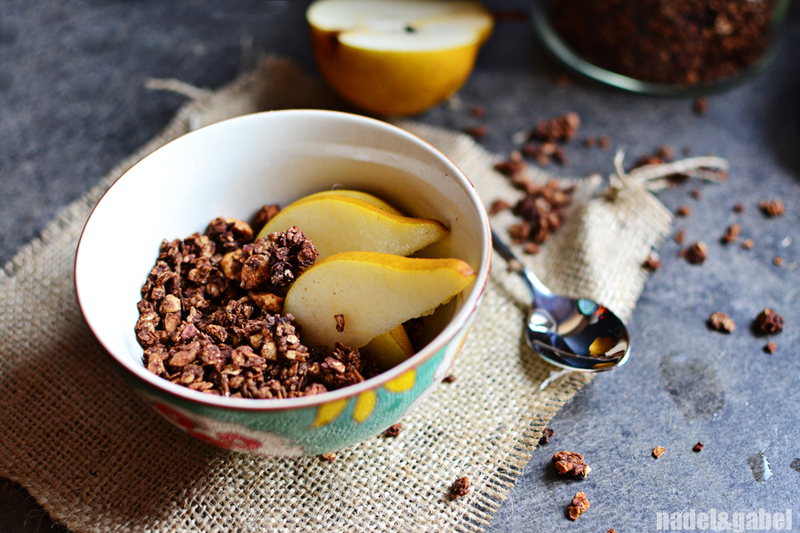 I adjusted Nicolas recipe to my liking – my attempt was to reach my favourite store bought granola and also meet my latest weakness for toasted hazelnuts. So what came out is a kind of minimalist crunchy granola that concentrates on the two flavours of dark chocolate and toasted hazelnuts. Preheat oven to 170°C. [If you don’t have already toasted hazelnuts at hand, you can easily do this at this point. 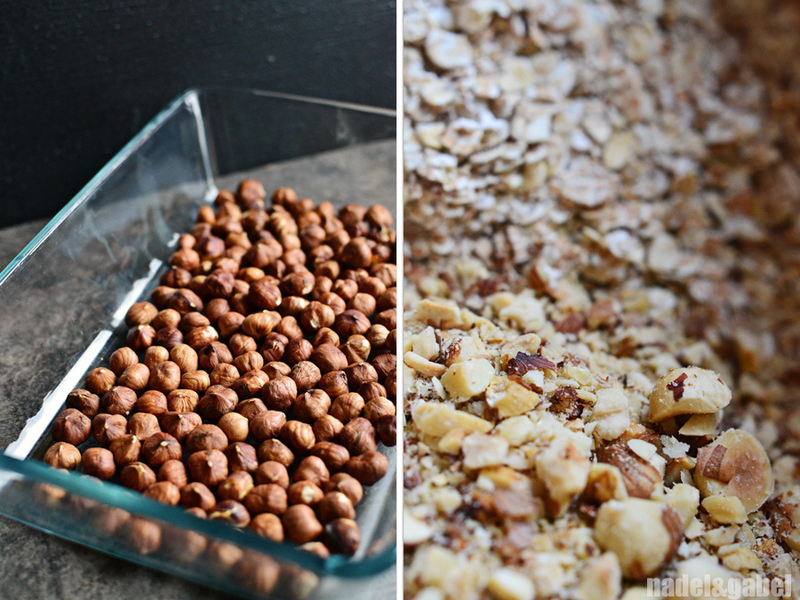 Place them in a baking pan and toast in the oven until you can smell the nutty flavour.] Roughly chop hazelnuts (in a food blender or by hand). In a big bowl mix rolled oats, hazelnuts, cocoa and salt. In a small pot heat 125 ml water on low heat together with roughly chopped chocolate, sugar and molasses. Stir in oil. Now pour chocolate syrup over the oats and hazelnuts. Stir well with a big spoon. Thoroughly cover all oats with syrup. Transfer to a lined baking tray, spread evenly and bake for 30 to 40 minutes. 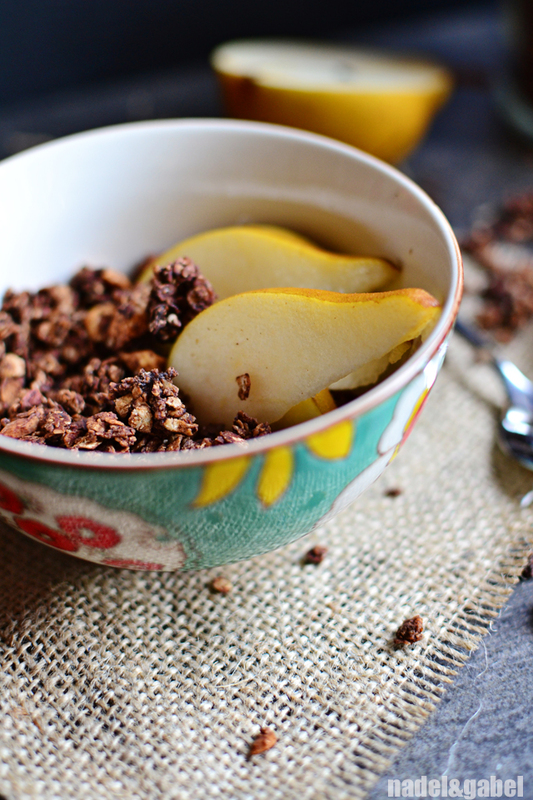 During the baking process, take out the tray about every ten minutes and stir the granola. Take it out of the oven and let completely cool on the tray. Maybe break bigger clusters. Transfer to an airtight container. 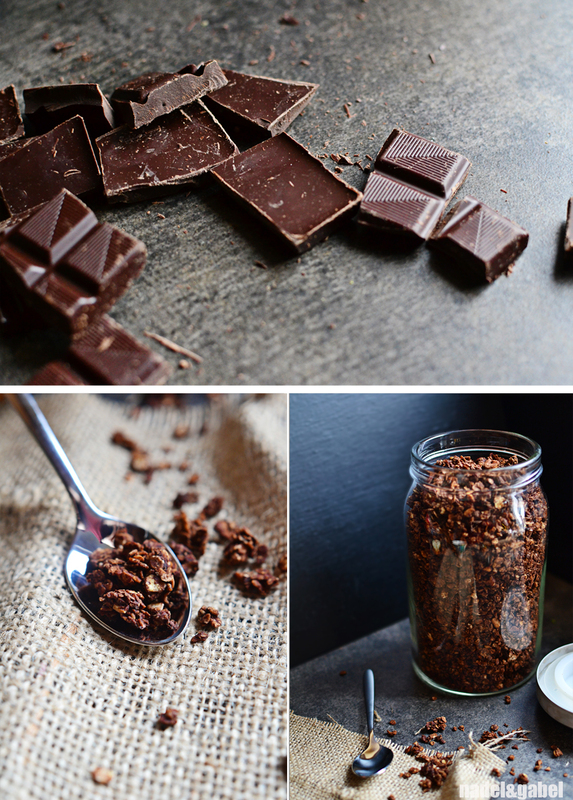 I have no experience in using cocoa nibs, so I am afraid I can’t help you in this point. But if you give it a try, let me know about the outcome! wow! That sounds really delicious! Thanks for sharing the recipe!